The two images above form part of a collection of photographs donated to Kingston Museum and Heritage Service by a gentleman called John Eagle. We don’t know very much at all about him but he enjoyed photographing Kingston in the 1960s! 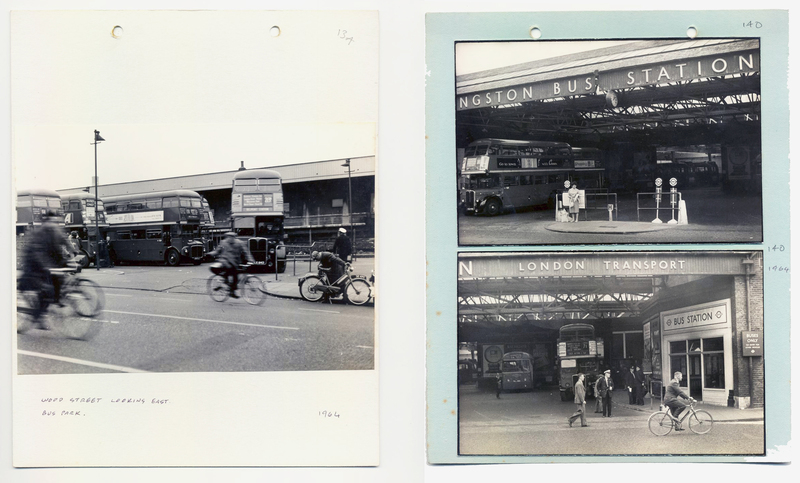 To the left, you can see a 213A to Belmont Station just leaving Kingston ‘Bus Park’, and the right hand image is captioned ‘Next to Kinema Cinema Out of shot on left looking east’, dated 1964 it shows the now demolished Kingston Bus Station. Kindly dug out for me by lovely volunteer Mick. The Bus Station/Depot was closed on May 17th 2000 after 80 years of use to make way for the Rotunda Complex. By that point, services had been running from Cromwell Road for 5 years (since 1995) and the garage had only been used by London United buses which eventually relocated to Tolworth Garage. The Garage was built for the London General Omnibus Company in 1922 and included an indoor waiting area. It was the only London Transport garage without automatic bus washers and until closure, all buses were cleaned by hand! 213s are operated by GoAhead, based at Sutton Garage, although historically they have used Kingston, Norbiton and Sutton Garages!